Your article’s title is the first impression that a reader gets from your article. The title is what determines whether a potential reader would click into your blog or just skip it. Write a title that provides enough information but at the same time, do not reveal too much so that it will invoke the curiosity of the reader. Question titles such as “How to’s” and “What Happened…” would easily invoke the curiosity of any reader and drive traffic towards your blog. If location, location, location is the mantra for property investors, then content, content, content would definitely be something blog writers would swear by. Your article titles play the role of bringing in the readers but it’s your content that determines how viral your blog post goes. Readers expect value when they spend their time reading your blog post/article and creating value in the article the writer’s job. Original contents are often time more shareable than copied articles. I have seen some blogs with amazing content but horrendous segmentation, which is a bad turnoff for readers. Segment your points and then elaborate on them. Readers will appreciate your effort in making their life easier and it also makes your blog looks cleaner. Google loves long posts. It will rank you better in terms of SEO and readers will love you better for providing them with a good, long informative post. It will make readers stay longer in your website and if the information that you provide are really good, they will have no problem subscribing to your email newsletter. 5. Use pictures, lots of them and make sure they are huge! In this case, pictures speak a thousand words. Put beautiful, large pictures/graphics in between your writings to break away from the monotony of words. This will keep the readers mind engaged in your post instead of turning them away from the article. Remember to caption your photo as well. A post with a lot of pictures makes it look more interesting and increases the tendency of a reader to share your content. A blog which provides proper facts and figures commands authority among the other blogs out there. There are a lot of blogs out there that throws in a figure without the proper source or a fact without a proper citation. Do not do that. If you write a fact, make sure it’s a proven fact and if possible, cite it. If you put in a number, make sure it’s a well-researched number and not some made up figures to make your articles look professional. Readers are particularly smart when it comes to facts and figures. 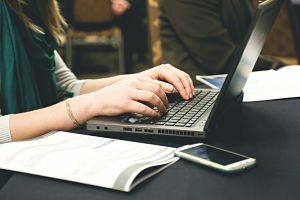 They can call a lie from a mile away and would turn away from your blog in an instant, damaging your reputation. It is important to find passion in writing to ensure its sustainability. Write about things that you love or things that you highly interested in. Not only will it keep you going in the long run, but it will keep your writing interesting for both yourself and your reader. You need to be updated about the topic you write. If you are passionate about a certain topic, you will do the reading and point out the observations before you start writing about it. Research for the most updated facts and figures beforehand. That will ease your writing process. To ensure the quality of your post, make sure you check your grammar every time you are done with your writing. If you are on WordPress, install the Grammarly plugin. Check your article twice before posting it up on your blog. Also make sure to use the proper word structure and double-check your spelling.